Computex 2009 has only just kicked off in Taipei, but already the show is making headlines. 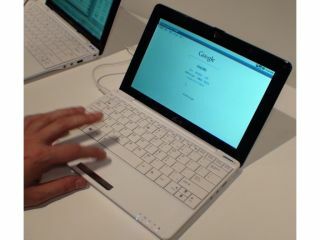 An Asus Eee PC running on the Qualcomm Snapdragon processor and using Android as an OS has been spotted at Computex. According to the eagle-eyed journo that spotted it, the machine is still in prototype but could be part of the initial line-up of smartbook PCs that will be released using the low-power Qualcomm Snapdragon. Impressively, the chip used is 1GHz and doesn't need a fan to cool, because the power consumption of the machine is so low. There isn't much news about the computer specs-wise, other than it sports a 10-inch screen, a 3G radio and a webcam. It was also noted that the chip inside is capable of running 720p video, which would make the 'smartbook' HD Ready. The price and release date of the Snapdragon Eee PCs are still to be announced. Check out TweakTown.com, where they have a video up of the computers in action.